Masonry is many things to many people. Many years ago in England it was defined as a system of morality, veiled in allegory, and illustrated by symbols. It is a course of moral instruction using both allegories and symbols to teach its lessons. The legends and myths of the old stone cutters and masons, many of them involved in building the great cathedrals of Europe, have been woven into an interesting and effective way to portray moral truths. In Masonry, the old tools and ways of the craftsmen are used to help dramatically portray those moral truths. For example, the 24 inch gauge and the common gavel. Just as the ruler is used to measure distance, the modern Mason uses it as a reminder to manage one of his most precious resources: time. And, as the gavel is used to shape stones, so it is also the symbol for the necessity of all of us to work to perfect ourselves. One modern definition is: Freemasonry is an organized society of men, symbolically applying the principle of Operative Masonry and architecture to the science and art of character building. In other words, Masonry uses ageless methods and lessons to make each of us a better person. has a basic philosophy of life that places the individual worth of each man high on its pedestal, and incorporates the great teachings of many ages to provide a way for individual study and thought. has great respect for religion and promotes toleration and equal esteem for the religious opinions and beliefs of others. provides a real working plan for making good men even better. has many important charitable projects. has a rich worldwide history. is a proven way to develop both public speaking and dramatic abilities and provides an effective avenue for developing leadership. "Freemasonry is NOT a Secret Society"
That is not Masonry at all! Masonry may have "secrets," but it is not a secret society. Masonic secrets are few in number, and deal with the general method of initiation, the ways we recognize each other, and very little else. These parts of the ritual, which are called the esoteric side of Masonry, have been handed down by word of mouth for centuries. 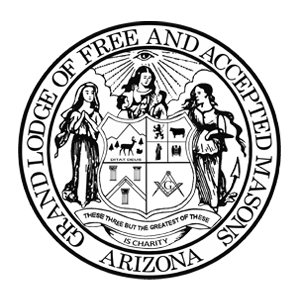 Masonry's purposes, ideals, and principles may be learned by anyone who inquires. There are numerous books on these subjects which are available to the public. Masonry often has public notices in the newspapers, and our members are usually numbered among the more prominent citizens in the community. "Freemasonry is NOT a Religion"
Masonry, as an organization, is understanding and tolerant of all religious thoughts. Masonry has no specific creed, no dogma, no priesthood. There are no requirements as to religious preference in becoming a Mason. Masonry does ask you to state your belief and trust in a Supreme Being. Nonsectarian Prayers are a common part of all our ceremonies, but are not offered to a specific deity. Masonry does not require you to belong to a church, synagogue or mosque although many Masons are very active in their religious organizations, and among our members are leaders of many denominations. Freemasonry accepts your right to belong to any church or religious organization of your choice and does not infringe on that right. Neither does Masonry try to be a substitute for your church. Masonry wants to unite men for the purpose of brotherhood; not as an organized religion.